James Frary is chief executive officer and a member of the board of directors of US Acute Care Solutions (USACS). In this role he is responsible for strategic planning, growth and all operational aspects of the organization. Mr. Frary also works with the company’s hospital system partners to ensure quality and innovative care is delivered to its patients. 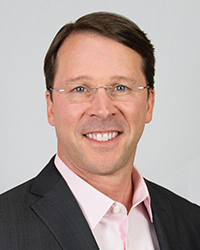 Most recently, Mr. Frary served as executive vice president and president, AmerisourceBergen Specialty Group (ABSG). In that role, Mr. Frary held strategic and operational responsibility for the company’s business units, in addition to collaborating across AmerisourceBergen to serve customers more effectively. Prior to that, he was regional vice president for AmerisourceBergen Drug Corporation (ABDC), where he had general management responsibility for the East Coast Region of ABDC. Mr. Frary was also a principal in the Growth Strategy practice of a leading global management consulting firm, where he led a broad range of growth strategy, mergers & acquisitions and performance improvement initiatives across several industries. Mr. Frary holds a bachelor’s degree in Economics from Stanford University and an MBA from Harvard Business School.